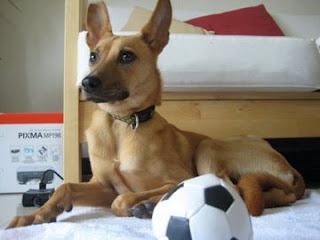 Maggie (please see attached photos) was rescued by Animals Taiwan in October 2009 from multiple abuse and broken legs. She has been living at a loving home and has finally learned to trust humans again. 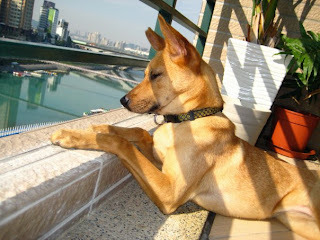 Maggie is now lost - she was last seen this morning at Xinyi Road and Dunhua South Road in Taipei City. Please help keep your eye out for Maggie. The tip of her right ear is cut off. If you spot Maggie, please call Animals Taiwan at 2833-8820 or her parents Michelle 0987-797-673 or foster mom Sarah 0955-447-542. January 17, 2010- Joey rescued a black dog that had been hit by a car on Dadu Road. The dog was taken to the vet, who performed an emergency operation to stop internal bleeding. Unfortunately, the arterial damage was beyond repair. All we could do for the dog was put him to sleep and end his suffering. On January 18, we took his body to the crematorium. We felt terrible that we couldn't save him. It’s heartbreaking to think that accidents like this are all too common in Taiwan. I'm glad I work at Animals Taiwan, where we do our utmost to save animals and educate the public. If we can convince people not to abandon their pets, then we can stop tragedies like this from happening. We finally have the road fixed. I would like to share this good news with you. The very dangerous road ( which was full of bumps and holes, and with a lot sharp rocks ) in front of the center was fixed yesterday with an asphalt road. 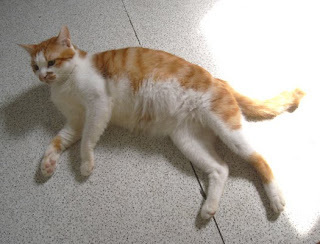 Do you remember our very sweet cat , Harry? He is back from his foster home because his foster mom is going to US for a month. 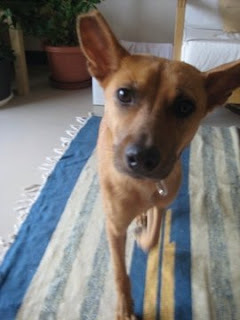 He will return to his foster home on March. 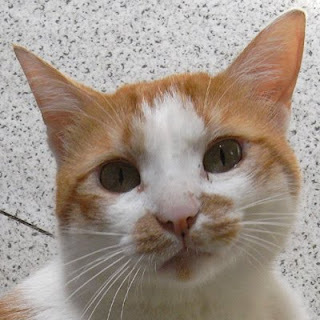 Please come to our center to say hello to him and give him a big hug.